How many more campaign tactics will go horribly – or if you like, hilariously – wrong for the Conservatives? Today, the Tories wanted to attack Labour with a Twitter hashtag. As Shadow Chancellor Ed Balls appeared on radio and TV programmes this morning, the Tories’ Carrie Symonds tweeted, “When Labour were in power they DOUBLED Council Tax. Now it appears Ed Balls plans to RAISE Council Tax again. #SameOldLabour”. The main Tory Twitter account joined in, with “Here’s how Labour’s last approach to ‘budget responsibility’ turned out #SameOldLabour #BacktoBankruptcy.” This one added a photograph of the famous “no money” letter written by former Chief Secretary to the Treasury, Liam Byrne. Perhaps this is what turned the mood of the tweeting nation. We’re all sick and tired of the Tories using that letter against Labour. It was meant in jest and it may have been a gross breach of protocol by the Tories to publicise what it said – not to mention being in very poor taste. This is a war of words that Labour is definitely winning – to Alistair Campbell’s joy: “Hope the Tory bright spark who came up with #SameOldLabour isn’t on performance related pay. Another @LyntonKCrosby campaign own goal,” he tweeted. enjoying the discomfort of the Tory spin doctors. Politicians and social media don’t mix. Or perhaps they could provide one especially for them, ‘Twatter’? 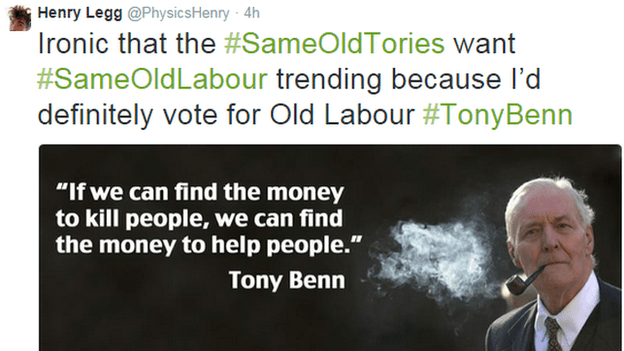 Nice to see Tony Benn helping out! i dont think raising council tax is a good idea for labour.the council tax wants reforming not by re-banding but by cutting the obscene salaries some of these people are on,as well as gold plated pensions and expenses. politicians dont learn anything from history do they ? Why do you think Labour is likely to raise council tax? If you look through the manifesto, the only mention of raising council tax refers to houses that are left empty in the long-term – and that’s a good idea because those buildings could be homes for people if they weren’t owned by someone who can afford to live elsewhere most of the time while paying a lowered rate of council tax on the building in question. Beyond that, I have no idea what you mean. sorry mike i got hold of the wrong end of the stick,i read it wrong. yes what you said above is a good idea and long overdue. but i still think council tax needs reforming along the lines i stated to take into account the salaries some of these people get. it cant be right that some of these people get more for running half a county,than MP’s get for trying to run the country,not that i’m saying MP’s salaries should be upgraded,these people’s salaries should be capped.there is too much dead wood in local government,it urgently wants sorting out. This is hardly the Conservative’s best ever campaign. I’ll have to give it a read. Johnny’s anti-Labour AND Conservative, so it wouldn’t surprise me. He still writes some very good pieces on the injustice of government policies. Labour’s manifesto seems to lack self belief, they are still running scared of the irresponsible borrowers tag, and still pandering to the likes of the Daily Mail and Middle England. No effort to tackle any root causes of the problems facing Britain today, just words and over an hour of my life I’ll never get back. I disagree – but then I bet loads of you were expecting that! Disappointed that my comment appears to have been deleted. It was my personal opinion after reading the manifesto. You are of course, free to disagree. I think it is best to wait and see what Labour do IF they win next month and discusss then. I was disappointed that you seemed to think you could make me approve your comments by commenting on the fact that they hadn’t been approved. I decide what goes on the page. Mike – in this morning’s edition of Radio 4’s “Today” Theresa May was quick to prattle on about “that letter”. That seems to be the limit of their ammunition. The now infamous note left by Labour’s Liam Byrne which read: “Dear chief secretary, I’m afraid there is no money. Kind regards – and good luck! Liam” has similarities to the note reportedly left by the Conservative Reggie Maudling to Labour’s Jim Callaghan when he became chancellor in 1964, which said: “Sorry to leave it in such a mess.” So, there y’are! That’s right – and I feel sure there was another one before that.